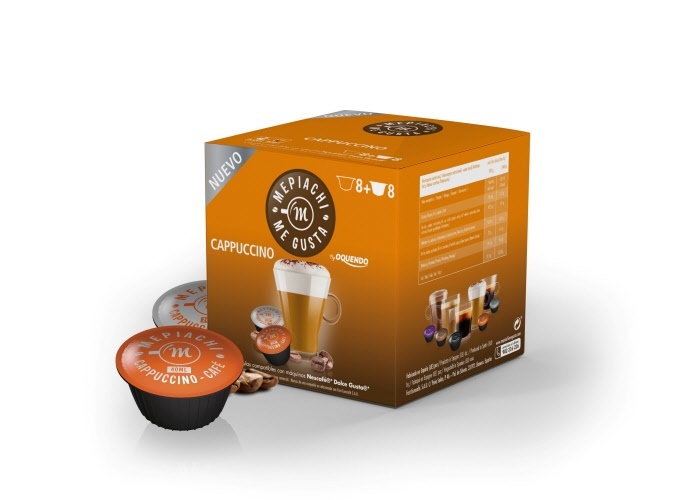 Compatible coffee capsules and Coffee Pods for Nescafé®* Dolce Gusto®* machines. Roast and ground coffee and whole milk powder with sugar. A genuine Italian style cappuccino A coffee with body so that it does not get 'drowned out' by the milk, very aromatic with milk and cream create a pleasant cream, consistent and durable. It provides smooth and sweet finish after-taste. To drink at any time of the day. To make the cappuccino you need first of all to use the espresso coffee capsule (pod) and draw off about 30ml into the cup, then remove that used capsule from the machine, and place the milk pod into the machine and fill the cup with the milk. Box of 16 capsules to make a great cappuccino, you use one coffee capsule, and one milk capsule per drink.